PaperCut - BOSS Business Systems, Inc.
PaperCut MF is a simple, low cost software application that lets you take control and manage your printers, copiers and multi-function devices. Many applications are moving “onto the web”. The advantages of doing this are clear: web technologies make cross-platform support easy, and the web based nature removes the need to install additional software (or access a system where the software is already installed! ).PaperCut comes “out of the box” with a web based interface for administration. There is no need to configure your own web server however, because PaperCut includes its own. Modern web design techniques such as tabs, effects and transitions even make PaperCut’s web interface feel like a traditional desktop application. In a quota-based or charged environment, one of the most important tools at the administrator’s disposal is the ability to charge different amounts for different types of documents or on different types of printers.Printers are designed for a particular task and a particular work rate. For example an inkjet color printer is ideal for photos or the occasional color page but should not be used print 1000-page black and white documents when the heavy duty laser printer is located just down the corridor. For printing PaperCut authenticates and tracks print jobs at the server layer before they pass to the MFD. To track off-the-glass device usage such as copying usage the authentication and tracking step needs to be done on the device itself. Where possible this is accomplished using embedded software. The embedded software runs on the MFD and works with the PaperCut Server to bring the same experience offered with printing to direct device usage. Web Print is PaperCut’s unique and industry leading solution to manage the growing need for printing from laptops, wireless devices and anonymous users. As a core feature of PaperCut, Web Print enables printing from user-owned devices without the overhead of installing printer drivers and managing server authentication. PaperCut’s Web Print has been deployed across hundreds of education campuses and is an ideal solution for offering print services via student owned laptops and netbooks.PaperCut can also track wireless printing from the iPad and iPhone (iOS devices). For more information and a free live demonstration of this incredible new and cost effective software you can contact us today by clicking the link or call (209) 952-2677. 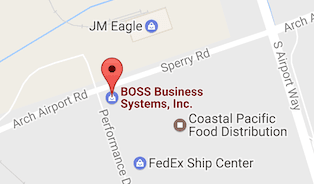 © 2017 BOSS Business Systems, Inc.